Twenty-four days to go. Have you decorated your Christmas tree and done your shopping yet? I'm in the middle of gift-wrapping and card-writing. It looks like I'm going to be travelling soon, so I have a week or so to get everything sorted. I'm also accompanying Gramps on hospital visits - he has been diagnosed with osteo-arthritis and severe anaemia. The latter is supposed to be the side-effect of ongoing treatment for cancer. 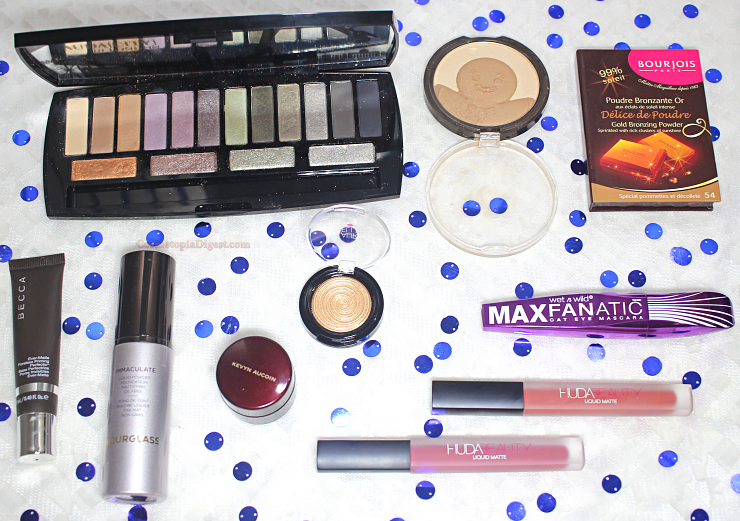 Meanwhile, I'll tell you about the beauty products I've been loving recently. 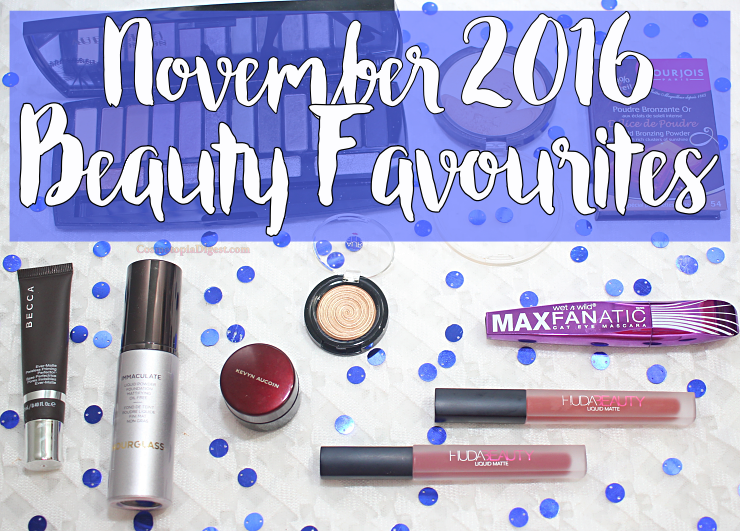 Scroll down to see my makeup and skincare favourites for November 2016. Reviewed here. I've been reaching for this palette pretty much every morning now. You get 16 eyeshadows, of which 12 are beautifully soft shades, while four are metallic "toppers". A very cute compact that I have to review soon. It could do with some more pigmentation, but this makes the list for the Gingerbread Man design and the oven-packaging. If I had to make do with just the one bronzer for the rest of my life, it would be this one. It smells and is packaged just like chocolate. The shade (54) is perfect for me. It blends beautifully and lasts on my oily skin. What more does one want? The only true matte primer I've tried. It is tricky beneath certain foundations - I use it with Giorgio Armani's Maestro Foundation or Hourglass Immaculate. It won't work well with NARS All Day Luminous or Kevyn Aucoin SSE or Too Faced Born This Way. I disliked the liquid-powder foundation formula when I tried YSL Fusion Ink, so I thought I wouldn't like this either. Wrong! I love how beautifully it blends and sinks in. Lightweight, with ample coverage. The only concealer I reach for these days. Thanks to Norah Salazar for recommending this - and helping me pick the perfect shade. I admit I tend to pick up too much of the product, and have to apply it all over the face, skipping foundation. Even so, this stuff covers EVERYTHING. I love this more than Becca SSP, which used to be my gold standard for highlighters. Gilded Honey is the perfect shade if you have olive skin. Reviewed here. Epic matte liquid lipsticks that don't flake, dehydrate or crack. Love the shades Icon and Trophy Wife. Also love the tropical scent to these. I don't attempt cat eye looks, so I wasn't too keen on trying this out. It works very well on my peach fuzz eyelashes and actually makes me look as though I have lashes. One balm cleanser to rule them all. It took me a while to get used to this, but now, I can't live without it. Eradicates all makeup - waterproof or otherwise - in one go, and you only need very little product. Brilliant. My HG second cleanser. Silky smooth and light. It seems to emulsify into a milk with water, and rinses off easily. Leaves my skin feeling fresh. DDG makes the best acid pads ever. I just invested in a 60-pack on Cyber Monday. I contemplated moving to the Extra Strength version, but figured this was doing a good job anyway. My favourite retinol formula. I worked up to this, starting with 0.025%. I only use this one or two times a week; it's slowly erasing my acne scarring. After all the acid, I do some heavyweight hydrating. This is the first light step, which preps my skin for the big guns. An "ampoule", in Korean skincare, has nothing to do with Grecian culture, but happens to be an intense serum. This is great for layering - I'm almost out of it and will have to buy another bottle. Got this as a GWP from Space.NK. It has become my go-to morning moisturiser. I don't know if it does any sculpting, but it does make my pores look smaller, and it is perfect for using beneath the Kevyn Aucoin Sensual Skin Enhancer. Having used some very luxurious facial oils, I wasn't expecting to be bowled over by Algenist. Colour me surprised. I rate this as highly as I rate Sunday Riley, whose Artemis and Juno I swear by. I'm almost out of this, and will have to repurchase. Mizon's Snail range has quickly become a staple in my routine - I begin with the All-In-One repair cream, and then apply the Intensive Repair Ex Ampoule. The Recovery Gel is the last step in my routine, and it locks everything in. Can you believe this costs just $5 for a 30ml tube? There are a bazillion anecdotes about women whose hands turned soft after they washed rice regularly. This is a quick-to-sink-in sleeping pack that won't ruin your pillows. I love how soft my skin is in the morning after using this pack. What products have you been loving recently? Tell me in the Disqus comment widget below.